When adorable blogger couple Eric and Caroline invited me to dinner at an unheard-of restaurant in out-of-town Banting, I almost turned them down. Firstly, Banting is so, so far for me! I would need to fly AirAsia or Firefly to reach there even though I live in PJ. OK, that's meant to be a joke. Haha! Secondly, I would surely get lost finding that restaurant! Not that I mind getting lost, but NOT when everyone is waiting for me! But when Eric offered to drive me there, well, how could I possibly turn him down? He and Caroline had been raving about the tasty food in that particular restaurant so it would be a waste not to try it! Besides, we would be having a gathering of sorts with my group of regular blogger friends - Witch, Saucer and Adrian. And we would be throwing a birthday surprise for Witch later which I've already blogged about HERE. 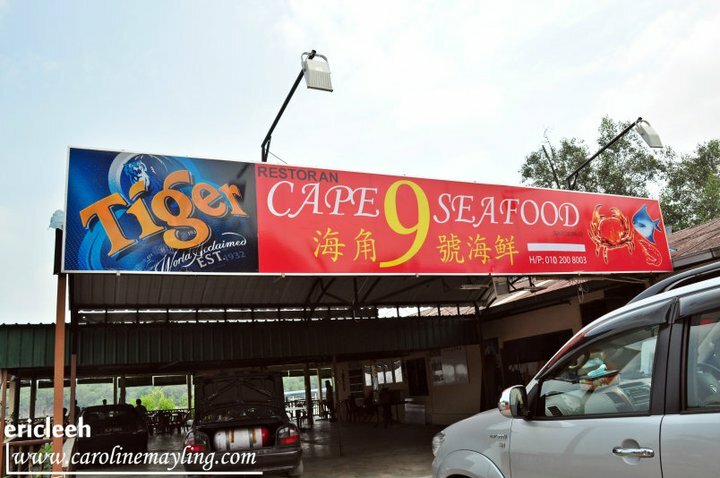 I forgot to take a picture of the front view of the restaurant which is known as Cape 9 Seafood Restaurant. So I'm going to borrow the photo from Caroline's blog. 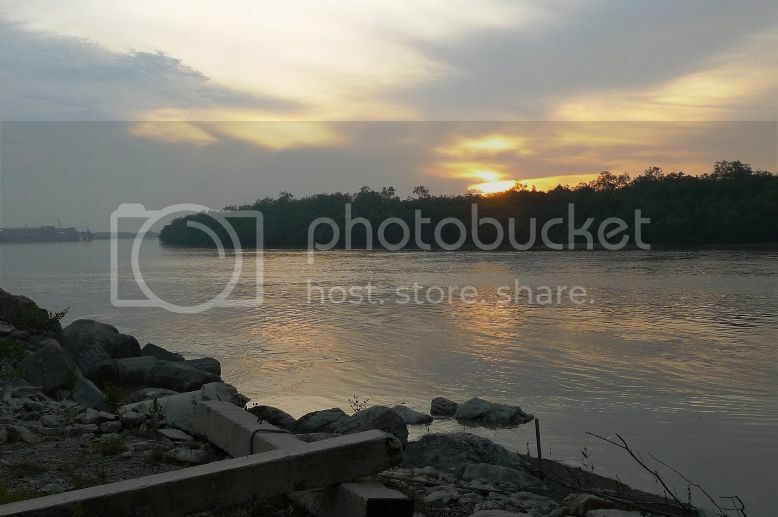 The restaurant was located by the river in this place called Kampung Air Hitam. It could not be seen from the main road and was hidden deep inside. We passed through a small village and a long stretch of bumpy road before reaching this restaurant. Boy, was I glad I did not drive there all by myself. Even Garmin and Papago would not be able to save me! I always like to dine in restaurants by the river, so the ambience here was quite good. We started off with fried beehoon. My, was it delicious or what?! I was quite surprised that the beehoon was not oily at all but yet tasted so yummy! 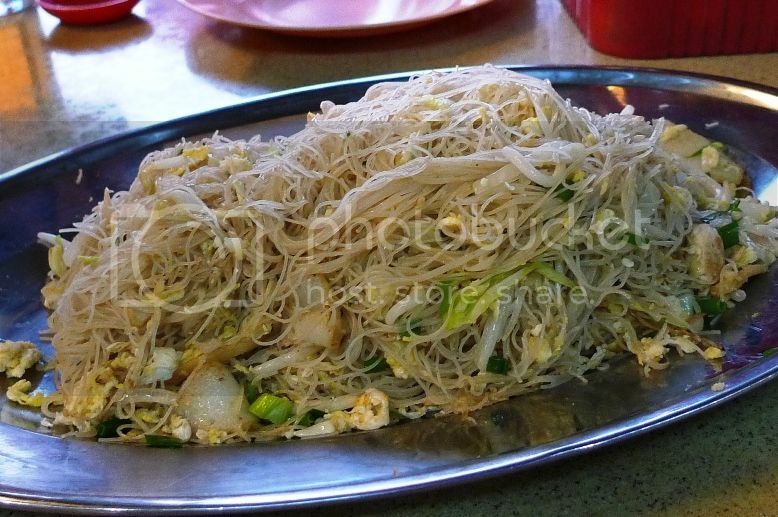 This one plate of beehoon was shared among all six of us but honestly, I think I can eat the whole plate myself! Next, we had lala fried beehoon. What?! Beehoon again? That's right! You won't be able to see much difference in the picture below as it is still beehoon. 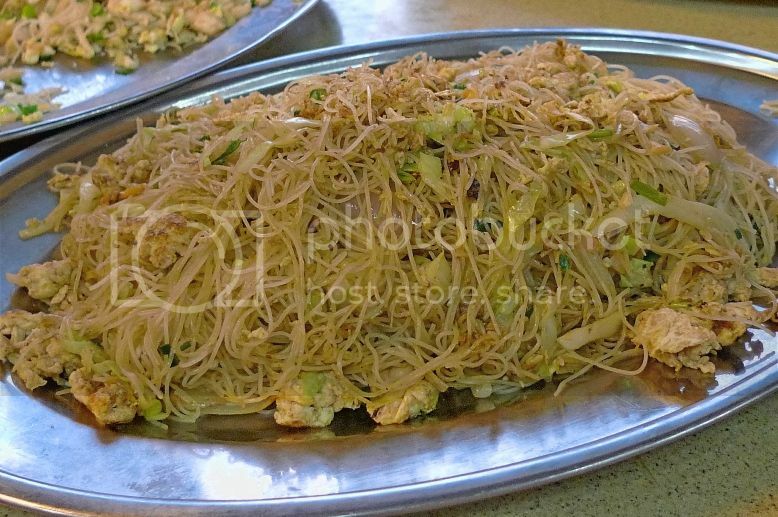 The taste was however different, with tiny pieces of lala in the beehoon. Both the normal fried beehoon and the lala fried beehoon were priced at RM10 each. 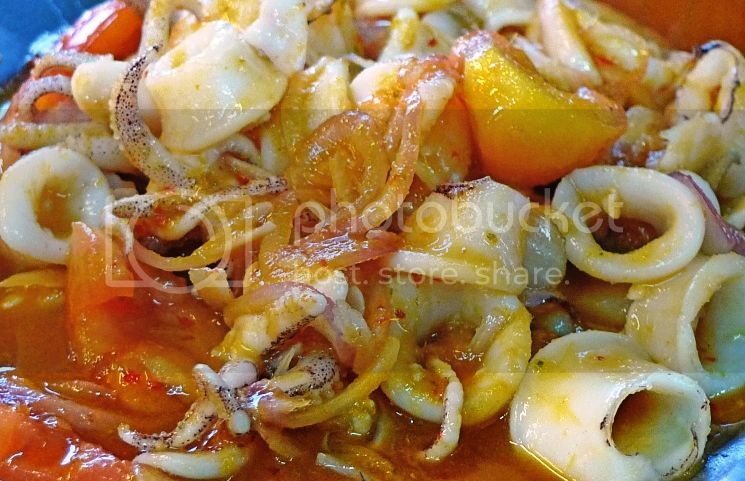 Now I don't like eating squids - it's something to do with the texture that puts me off - so when Eric ordered nyonya sotong, I knew I would not be eating very much of it. Well, guess what? This dish ended up being my top favourite that night! I guess it had to do with the yummy sauce! It had transformed me from a person who hates squids to a squid lover! LOL! I just could not get enough of it! At RM18, I think it was worth it! 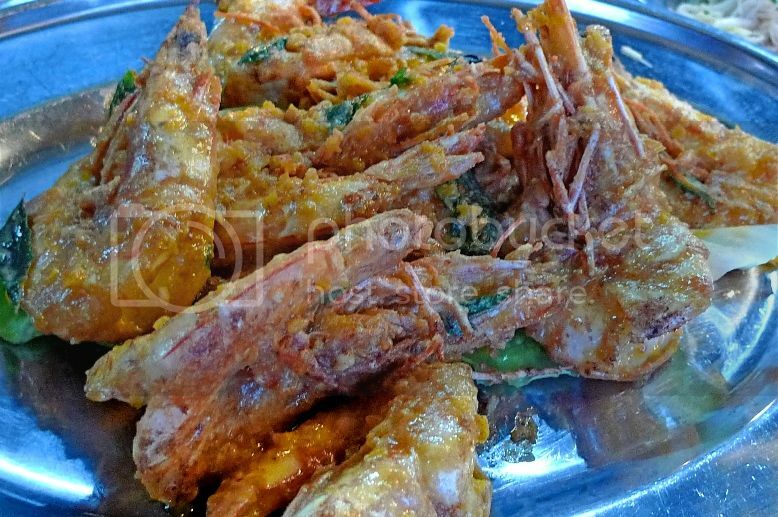 Next we had fried salted egg prawns. Now, I am a huge fan of prawns, and would love any prawn dishes unless the prawns are not fresh. Priced at RM35, this prawn dish was quite good. The prawns were big too, but I still think the nyonya sotong trumped it. The next dish was steam lala. OK, I forgot to take a picture of this dish until it was already halfway eaten, so it should really looked better than this. The lala meat was quite juicy and yummy! It was priced at RM20. Lastly, we had kam heong crab. "Kam heong" is a Cantonese word literally meaning golden fragrance. 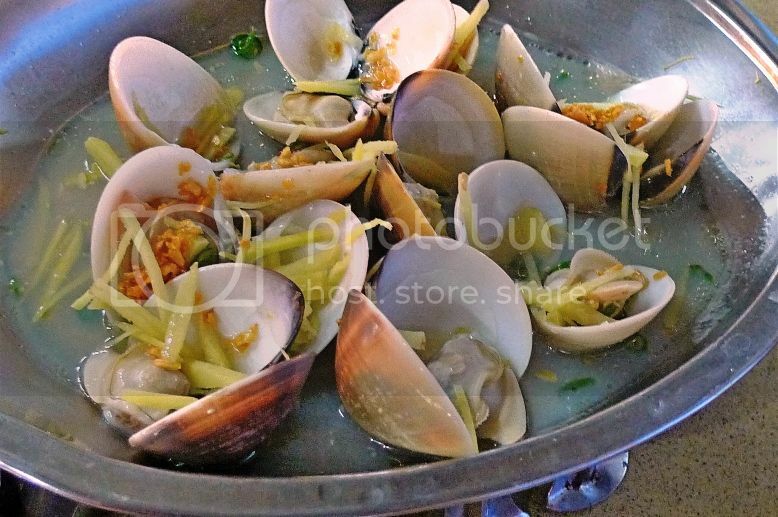 Crabs cooked in "kam heong" style are very popular, at least in Malaysia. 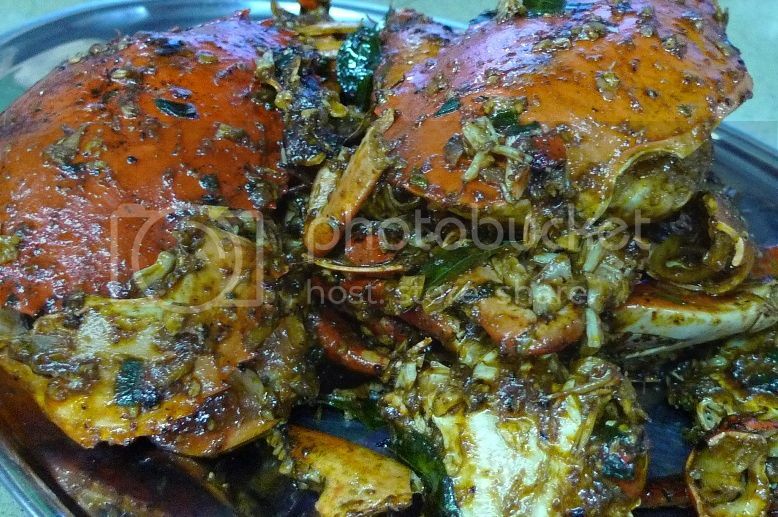 I am not too sure of the ingredients to create this crab dish but I think it probably contains curry leaves, dried shrimps, shallots, garlic and chillies. Well, this RM51 crab dish tasted great with the nice "kam heong" aroma! We had a satisfying meal that night. On the whole, the food was nice and the price was not bad too. So Eric, when are you driving me there again?